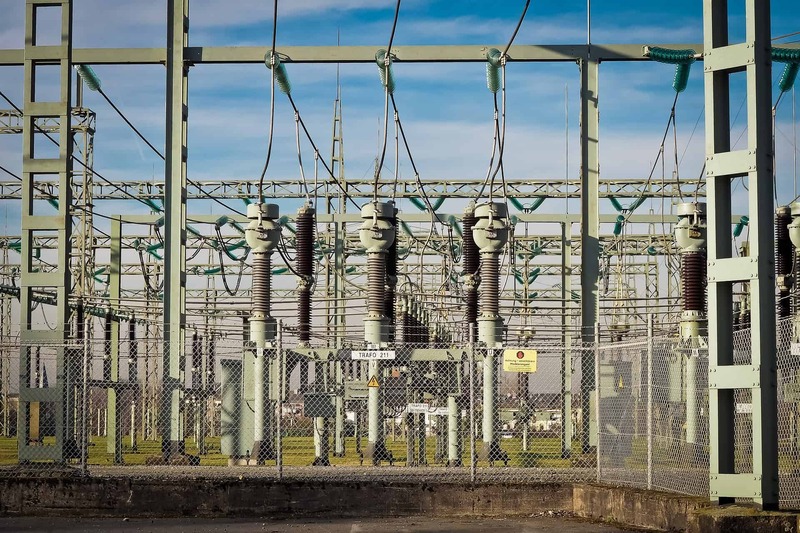 On the base of our knowledge and experience we produce equipment to perform diagnostic measurements of the transformer as well as to control its operation. 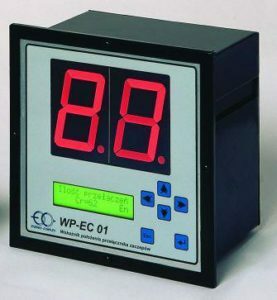 WP-EC indicators are devices designed to detect the position of the on-load tap changers (OLTC). Their modern design allow to use them in any type of OLTC as well as in many configurations. The NWP-EC transmitter is an electronic device based on a 10 bit digital optoelectronic encoder. This solution means that the device is not limited to discreet tap positions, constant maximum number of positions or division of angles between the positions. In the programming process NWP-EC 03 can be adapted to any number of tap positions as well as the direction of change or division of angles. NWP-EC 03 transmits the position of OLTC in the form of a BCD binary code and is also equipped with a two-direction RS-485 port. The design of the receivers is based on single-chip industrial microcontroller providing wide opportunities to adapt the device via software, having high reliability in operation in the power network environment. Large microcontroller capabilities allow to obtain additional benefits related to the acquisition of data on the OLTC operation, which can be used e.g. for the analysis of faults. The device is equipped in data transmission protocols that facilitates communication with external systems via RS-485 port. DNP 3 transmission protocol enables the transmission of data using the EX system. 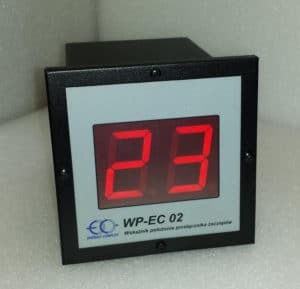 WP-EC 02 is a device decoding the OLTC position information received in BCD code and visualizing it in a digital form on the LED display. Due to the simple construction it is cheap and reliable in service. WP-EC 02 can be operated with a transmitter NWP-EC 03 as well as with any other suitable source of the BCD signal (diode matrix). Encoders MK-EC are devices based on industrial microcontrollers immune to electromagnetic interferences allowing for reliable operation in conditions of electric power facilities. They are used to encode a signal from the contact matrix of the tap changer drive to BCD or RS485 code. Compared to traditional diode matrix it is supplemented with a RS485 serial communication module making it possible to reduce the number of cables for communication of transmitter and receiver. The encoder of the OLTC tap position type MK-EC is designed to work with any OLTC drives containing contact disc mapping the tap number with wires leading from each contact. It is particularly suitable to drives with an untypical value of rotation angle of the contact disc per each tap and in the case of ambiguity in the mapping of tap numbers on contact disc (i.e. change of two contacts results in a change of one tap). 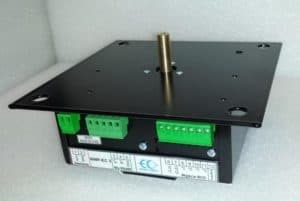 The encoder MK-EC is designed to be installed inside the drive cabinet on the DIN rail. MT-3 with new technical solutions simplifies and speeds up the measurement process. 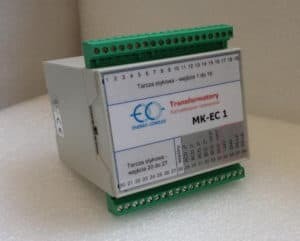 The device contains relay matrix and 12-wire measurement cable for full automation of measurement for the most common transformers (there is no need to modify the measurement system – no reconnecting of cables). Selection from the control level the measurement of a certain parameter (e.g. winding resistance or ratio) switches to proper connection setup and measurement conditions. The remote control of OLTC allows to automatically repeat the measuring procedure on all taps. 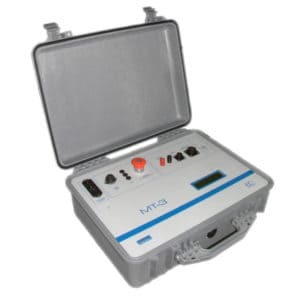 An interesting feature of the MT-3 is a three-phase measurement of ratio and magnetizing currents, which significantly reduces the time of measurements. MT-3 is equipped with a protection of measurement systems against surges caused by the circuit interruption during winding resistance measurements. The method used to connect the measuring cable to the transformer terminals and measuring box minimizes the risk of accidental circuit opening, and applied electronic protection eliminate the risk of damage! The topology of MT-3 measuring systems is based on the circuits designed and manufactured by B&C Diagnostics specifically for use in the diagnostics of transformers. This has provided a significant increase in the measurements accuracy and elimination of an additional external source for measuring the resistance of windings (for measurement of a very small resistance, it is possible to use additional forced current up to 50 A). MT-3 is operated with external computer equipped with dedicated control software and system for the acquisition, analysis and data visualization. This approach provides a significant reduction in size and weight of the device. Communication between the MT-3 measuring system and the PC is realized via LAN using TCP/IP or IPX protocols. As a result it is possible to use for the measurements any PC equipped with a network card and working under Windows 98/2000/XP/7. On the basis of the rich experience gained during the operation of the previous sets of MT family we developed the software that allows for efficient measurements of individual parameters, their analysis and results evaluation. Among other things, there is automated process of calculating deviations and errors, converting temperatures and also the comparison of the measured values ​​with the test card or the results of previous measurements. It is possible to compare the registered characteristics when switching OLTC, which allows for determining its condition.